It's easy to make all links to open in new tabs, because it can be done by adding a single line. If you want only specific links to open in a new tab, it's a different story. Same concept though. Finding the correct HTML portion is the hard part. I'll walk you through a quick example. Let's say I want my posts to open in new tabs when the title is clicked. First, inspect the link and try to find any class or ID associated to it. If you're not sure how, check out this tutorial first. See the example below. 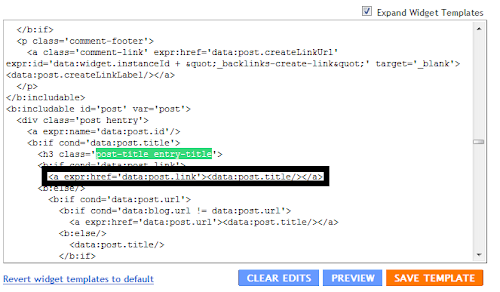 In this case, the link is defined under the 'post-title entry-title' class. So go edit this template's HTML - and find for 'post-title entry-title'. Clearly, I have chosen a wrong example for this tutorial. In this particular example, you have to add 'target='_blank' twice as there are two 'hrefs' under the class. After double-checking, this works on the Flock browser for me (which I use) but not on Safari, which I know is much more widely used. Any advice? Faubs: Now it seems to be working fine, with Firefox and IE. This is a standard HTML tag, I'm not sure why it doesn't work with Safari. I guess this is something you should consult with them (the Safari support team). Sorry I couldn't be much more of a help. Excellent instructions - thanks for that, it works perfectly. @Barking Spider: Glad you think so. Enjoy your stay here. Cheers. Thanks for your great tutorials. They've helped me with several issues. Brilliant work you do. But I have problems with this one. I want the links in my posts to open in a new tab. Only the content/links in my posts and not the title or any other link on my blog. Okay, sorry to hear that. Thanks for your valuable help none the less. It worked! And I don't know HTML programming. I had to use this new tab option because my top-of-page news feed had been running as a changing news headline, but all links opening in new tabs had screwed it up so a list of news headlines appeared instead of the single changing news headline. My question today is, why is my news feed opening in one line anyway, instead of as a list. By the way, I want it to remain as one line, but I don't know how my 'happy accident' has occurred all this time. I need to know why in case I start another blog, but can't get the one-line feed for whatever reason. Thanks to you or to anyone who can enlighten me. @Satchel Pooch: Glad you asked. There are two versions of newsreel gadget. One has a long vertical list, and another one is just a line, as in your case. You don't have the option to change from one to another just by clicking edit on this gadget. But, if you go to Dashboard - Design - Page Elements and add your newsreel gadget below your header or above your footer (Or any 'Add a Gadget' link that belongs to a long stretching section), you will get the one-line newsreel. But if you click on 'Add a Gadget' on your sidebar, you will get the long vertical list. Basically, it depends on which 'Add a Gadget' link that you click on. Hope this is what you're looking for. @Satchel Pooch: No problem at all. Is there a way to make just my external links (links gadget) open to new tabs? 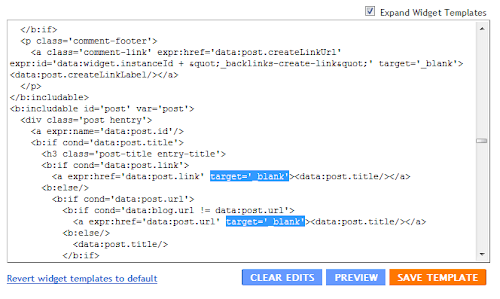 @David: Blogger's engine uses variables to fetch your linklist data. As such, it is not completely transparent for us to do any HTML modification. In other words, altering (re-engineering should be the right word) LinkList's HTML code isn't the best solution. @belinka: Glad you like it. Enjoy your stay here. Thank you so much -- this was incredibly helpful! Many Many Many thanks buddy. It work for me. Now all links open in new tab. Its really good trick. If we follow this process, then adsense add also open in new tab? @Anonymous 1: No problem at all. Glad you find it useful. Cheers. @Anonymous 2: I don't think so. AdSense links are dynamically generated. Only based links will open in new tabs. Feel free to try it though. Cheers. 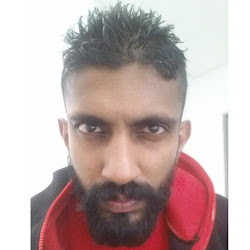 @SHREE: Glad it worked mate. Cheers. but how to open the links from the "link gadget" in new tab? any idea? @Anon: Which link gadget? Are you talking about the linklist gadget? Linklist gadget open links in new tabs by default the last time I checked. thank you very much for your work. I have yet modified my page with your great blog. 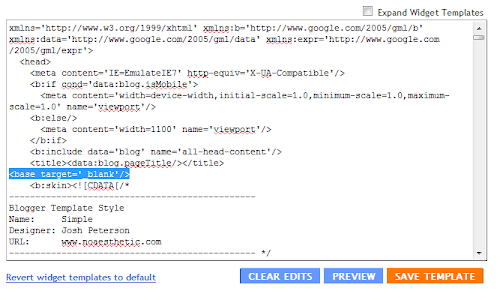 I don´t find the code of the page "xing" in the html code. Is your device possible for dynamic views ? I have checked my site on chrome,ie and firefox. The Bacckground of the headerline in firefox is instead of white semitansparent. Why? also text from static pages is sometimes cutted at the end of the page. Can you help me? 1) What do you mean by 'xing'? I'm not quite following..
to 1) Sorry, xing is the name of one of the pages in the Header Bar. I want to open this hyperlink in a new tab, but I don´t find the element in the html-code. to 2) the header is in ie and chrome white but in firefox it seems like a light grey (only the Header), the rest of the page has got a white backround. What´s wrong? you do really a good job! 1) I can't think of a specific way to open the header links in a new tab. But even if there's a way for it, I'd strongly recommend you not to do it. 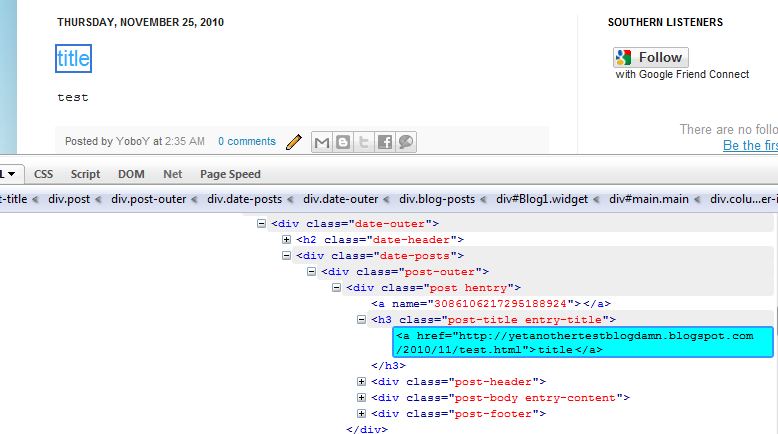 This is because there's a huge side-effect when you begin to edit your template's HTML.. Once you've editted your Dynamic View template's HTML, it will not get new updates.. To be specific, the jquery version defined in your template will not be updated when Blogger releases the next update. 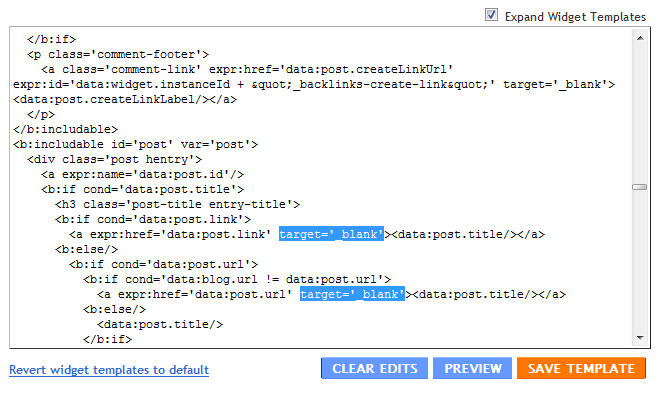 As a result, lots of features, including your comment link and share buttons, will not be clickable..
to 1) you´re right. the disadvantages are bigger. Is there any way to open the hyperlinks on my blog's comment sections provided by the spam commenters in a new tab? The new threaded comment is running from scripts. We can't use HTML to open links in new tabs anymore. Hey Yoga, once again great site. Any time I have a Blogger question I come here first as the instructions are succinct and easy to follow! This particular posting worked well, just what I needed! After following the directions exactly though and clicking save HTML and close, I noticed that the mobile site example immediately lost it's colours. I double checked this on my smart phone and it's true! My blog is at www.daves80s.com. That is odd. Try this. When you reverse the tweak, does the colors on your mobile template go back to normal? New blogger here...and your tutorial is quite helpful and I've implemented this already for some of my links. Now I have the pages list gadget which contains links to 4 pages. I only want one specific link to open in a new page and in html the links aren't broken down so don't know how to proceed.. Any advice? Whether or not it is possible for specific links to be opened in new tabs depends on the kind of template you're using. Let's have a look at your blog. What's your blog's address? Hi Yoga, yes the address is choulachou.blogspot.com. This is for the 3rd link (shop) of the pages list only. and see if you could help me figure out how to get "5th Street Vintage" and "Shop" page links at the very top to open in new tabs without everything else opening in new tabs? Thank you so much! Hello I have started two blogs (only one is online as yet) recently and your posts have been of great help to be able to customize them as you explain all steps very clearly and it's easy to follow... Thank you for this ! Is there another post within your blog which explains How to open specific link/anchor within the same post once all the links are set to open in new tab, please ? Thank you for being so patient with me and responding so quickly... I knew I was missing something here as I could see a complete code in your comment... Thank you for this new tip ! I think you've got your initial issue covered - to force a link to open in the same tab. What you're facing now is more like a defect in the link itself. Anything that starts with 'http://www.blogger.com/blogger.g?' is a bad link to begin with. In order for anchor links to work, you need to publish the post first, and get its direct link. You can make your blog private first if you don't want to go live yet, but you definitely can't work with unpublished links for anchors to work in Blogger.. Once published, edit your post again, and use its full published URL in your links. Just a heads up, should everything work fine, and you decide to HTML-edit your post for some reason, your links will get effed up again, and you need to re-touch them. At least that's what I noticed the last time I dealt with anchor links. Thank you very much ! I think you identified perfectly the problem! I am sure it will work once the blog is published and once I have replaced the faulty URL with the actual one. Thank you again for your kind help and thorough replies. Wishing you a very good week ! I finally managed to get along and that because of you and thank you!I inserted some code in the blog template and nothing has changed for example I want to apply" reed moore button".I did then no copy of the template and do not know how to remove those codes.Again nothing happened bad with the blog, only I could not do it, you can help me?Thank You! If I'm getting you right, are you saying your Read More script isn't working properly? Where did you get the script from, and how exactly did you insert it to your blog? Apologies if you have covered this before. I am trying to make "Pages" "Web Address" link open to new tab. I cannot find any similar code in the HTML to experiment with. I'm having the same problem as Christine. My blog has 6 Pages, but only one of them goes directly to a new site, and I'd like to have only this one open in a new tab. Do you have the HTML for this posted online? That said, it must be noted that you'll lose the 'highlight current tab' feature if you were to switch to a HTML gadget - as in all the tabs will have the same color. That is a little tricky. Depending on the template you're using, you need to edit your HTML, and add target="_blank" to all dynamic link reference within your template. Problem is, these links are not very straight forward, and chances are you might not find all of them. Is there a way to just have a single page open in a new tab? On my site (http://diegogranados.com/) I'm trying to get my Resume page to open in a new window. Hey Yoga, Can you please take a look at my Blogger website, its www.irobotgaming.com I just need the "Gameplays" button on my menu bar to open in a new tab. Is there a way to do this without replace my complete link list? Would really appreciate your help. Is there any way to enable lightbox with Dynamic views? Either with CSS code or editing the HTML? I'm afraid not. DV templates have own structures that are not editable - there isn't much we can do about this, unfortunately. Thanks for the clear pictorial explanation. I have got it done. This simple solution has solved a lot of issues for me. I had a peculiar problem, I have a blog where I want to open links in my home page into a new tab as my blog links all posts to external sources. I used the following code before (/head) in my Template. It worked well but the problem was it opened all links in the blog in a new tab since the above code was generic in nature. As an example I could not add even a "Back to Top" widget for the simple reason that even this functionality opened in a new tab which to say the least is irritating for the user. Thanks to your simple and lucid solution, this major problem is solved. I am trying but it doesen't seems work. I need new images open in a new tab instead that in the gallery right now. 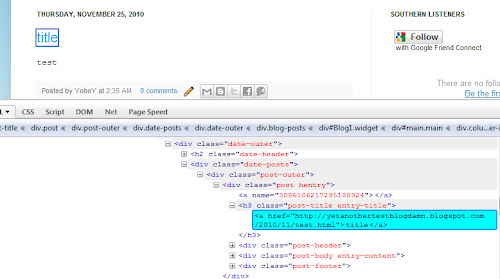 You just saved me a lot of time and tedious effort editing all links in the blog i maintain to "open in a new page"! And i just wanted to let you know i was a bit concerned when the b:skin line in your example was not an exact duplicate of the b:skin line in my template. Yet everything is working to a !T!hanks! YASSSSSSS! Thank you so much! I've been searching and searching for an answer to this. So many bloggers got it wrong, but you did not! Thank you!! I wish I had found this a few months ago when I started blogging. Thanks so much for the info, it is so helpful! Thank you so much! Worked like a charm!! Maria, glad you got it sorted.. I'm afraid we have very little control on this, unless if the gadget is a third party one added via the HTML gagdet.